Evernote’s Android app is already pretty awesome, allowing users to integrate text, to-do lists, photos and more seamlessly into their notes. In a blog post today the team explains that with its latest update it wants “to extend the Evernote experience” even more and it believes the best way to do that is with a neat handwriting feature. Users just need to tap the paperclip icon and choose a thickness and colour to scrawl their notes with. They then tap the drawing to revert back to text mode. 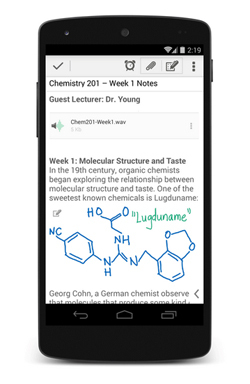 Like the screenshot to the left, users will be able to add handwriting sections into their notes alongside text and images too – the chemistry class example is a pretty good way of illustrating the need to move back and forth between the different kinds of notes. Get the Evernote app (or just update it) from Google Play. Is Metro.co.uk no more? Is a merger with Mail Online on the cards?